The Honey Thief, by Elizabeth Graver, Harcourt, 1999. I like my novels to be well-written, to speak to the pathos and grandeur of the human condition and human relationships, and to tell a compelling story. Graver’s The Honey Thief excels at the first two, but the story itself was just alright. The Honey Thief is the story of 11-year-old Eva and her mother Miriam, who move to the country after Eva gets caught shoplifting. The lonely girl meets Burl, a bachelor beekeeper who becomes her friend. They find in the bees and in each other a respite from their loneliness. The novel unfolds, in bits and pieces, the backstory of Miriam and Eva’s father Francis, Burl and his lover Alice, and Eva’s childhood. Graver’s writing demands a slow reading, as she packs her prose with rich descriptions of the subtleties of human interactions and emotions. The imagery and descriptions of the bees’ activity form a metaphorical framework for much of the character development, and Graver handles this with a gentle touch that invites comparison without being heavy or pedantic. The book is filled with glimpses into the psyche and motivations of various characters, and Graver gives beautiful expression to their experiences of self-doubt, fear, awkwardness and love. The characters were likable and believable, while still feeling otherworldly. I only wish her character and word power had been accompanied by a better plot. The backstory revealed in pieces throughout the novel was interesting, but not compelling, and the events taking place in the present of the novel seemed haphazard and disconnected. The plot did not seem to advance the characters or their relationships with one another, and sometimes seemed to get in the way. Maybe that’s what Graver was going for–describing the way life happens at random. But I don’t think so. I enjoyed reading this book, but usually I find I can’t put a novel down once I’ve started it. This one never really captivated me in that way. Yet, it was beautiful, and for that I am grateful. Because sometimes it’s too funny to keep to yourself, even if it’s TMI. B. has a wonderful creative eye. He sees familiar shapes in everything–animals in the clouds, boats in a half-eaten cracker, faces in a tree stump, and on and on. Apparently, he really sees those shapes in everything. So there we stood, peering closely into the toilet, holding our noses, admiring his creation. Which, I must confess, did bear a resemblance to an alligator. Complete with eyes and a tail. I’m long overdue to post an entry about B. Today his preschool went on a field trip to Krispy Kreme, a bookstore and an art supply store. He had a great time, and told us about it all in great detail, right down to naming the three colors of sprinkles on his doughnut (red, pink and white). When we got home this evening, he was playing with his cars and trucks, and pulled out a school bus to join in. Rather than the normal habit of having races with cars and trucks or fighting fires with fire trucks, tonight we took the school bus all over his room on a whole series of field trips. We went to the fire station twice, and B gave a tour of the fire truck, showing us hoses and ladders and how the siren worked. We went to a “different bookstore that has animals,” and an ice cream parlor. He sounded just like his teachers. 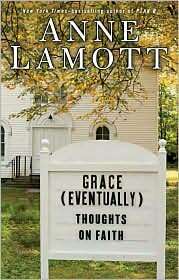 Gra ce (Eventually): Thoughts on Faith, Anne Lamott, Riverhead Books, 2007. I love you, Anne Lamott. You open yourself and your life to us, wringing beauty and grace out of the confused and pathetic pile of feelings and mistakes and heartache that is this life. You make me want to be a more careful writer, a more mindful observer, a more generous friend, and a better person. Thank you for opening up your own brokenness so the rest of us don’t feel so alone and ashamed, and rendering beautiful the mess of it all. The parts of this book about grace were a gift to me. I don’t know how you make yourself so vulnerable. It takes great courage to expose your inward panic and problems–but that vulnerability in life makes God’s grace possible, and the corresponding vulnerability on the page makes you and your writing a means of grace for me, your reader. I was especially struck this time, this book, by the parts about motherhood. You capture the desperate floundering about that I feel in my own parenting, as well as the absolute joy and delight in my son’s life and discoveries. You give voice to my feelings of helplessness and worry over his well-being and my own, and your words were a beacon of grace to me. You made me feel like I’m not crazy. Or, better, that I am probably crazy, but at least I’m not the only one. Thank you for the grace that flows through this book. 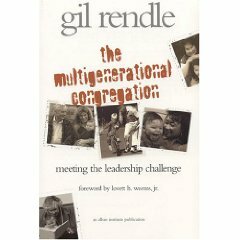 The Multigenerational Congregation: Meeting the Leadership Challenge, by Gil Rendle, Alban Institute, 2002. I heard most of the material in this book at a one-day workshop led by Gil Rendle, offered by the Center for Congregations a few years back. On the heels of reading Tribal Church, I wanted to review the material here for a different perspective on the same challenge. 1) Many contemporary congregations are divided not only by age but by tenure of membership. He describes a “bi-modal” congregation, which is full of members who have been there more than 20 years and less than 10 years, with very few who have joined 10-20 years ago. These congregations have two radically different groups operating within them, with few “bridge people” to navigate between their differences. They are usually divided by the typical pre-boomer (GI) vs. post-boomer watershed hallmarks (group vs. individual identity, deferred pleasure vs. instant gratification, assumption of sameness vs. difference). Both groups are active within congregations. One of the most interesting observations of this part was the distinction between the spirituality of place vs. the spirituality of journey. This was new to me, and very insightful. Quoting Robert Wuthnow, Rendle says that, in times of stability, people build dwellings and places that connect to the sacred. In times of instability, the sacred is and must be portable and moving. For members of the WWII generation, life has been stable and settled; therefore, their spirituality is stable and settled–they build places where the sacred dwells, like churches and rituals that contain the sacred. For the Boomers and subsequent generations, we live in an unstable world and celebrate a spirituality of journey. For us, God is in the pilgrimage rather than the place. I realized that I have been preaching almost exclusively to the spirituality of journey, having really had no conception of a spirituality of place. I have several holy places that mean something to me, and I revisit in search of God–but that’s not the same thing, because they are just oases on the spiritual journey. Rendle’s insights helped me see spirituality rather than just stubbornness and tired tradition in people’s connection to our stained glass windows, liturgical garb and Christmas decorations. 2) In a world that continually segments people into increasingly specialized and individualized markets, the church is unique because it is not a “pure market” environment. What a blessing! Rendle praises the inherent, unavoidable friction that is present when you have two such different groups trying to work together and live together in a church. Increasingly, television programs, books, methods of communication, clothing, movies, restaurants and other cultural institutions are targeted to a “pure market” of like-minded, similiar-aged and experienced people, “people like me.” Most mainline churches are not pure markets, because they are composed of people with multiple political opinions, incomes, educational levels, neighborhoods and even races. Friction is inevitable, but a sign of health and growth in a congregation. I must say, this multigenerational experience is one of the things I value most about life in the congregation. I am grateful to Rendle for the clear, concise explanation of the systems and perspectives at work. I will be contemplating the difference between a spirituality of place and a spirituality of journey in my next sermon series. I am supposed to be spending this precious time away from the house crafting my sermon for tomorrow, but instead I am posting to this blog. I haven’t had time or mental space to write in several weeks, and I miss it. There are several entries waiting to be written, but again they will have to wait. Today I feel overwhelmed by the prospect. Not because I have too little to say, but too much. And far too little time. That’s not all that is rolling around in my head. Also this week, a dear, dear friend was a victim of violent crime, and a family member was deployed to Afghanistan suddenly and unexpectedly. I have done three funerals in 10 days. Two were for loved ones who died unexpectedly and threw their families into tumult, folks who were older but not elderly or dying. The third was for a homeless man who frequented our church’s soup kitchen, who died on the streets on Christmas Day. But all has not been joyless. Last Saturday, the church held a planning retreat that excited and empowered a new group of church leaders who have already stepped up and begun amazing new initiatives that give me great hope about our congregation’s future. Our youth group is planning to join another church for a mission trip this summer, and already eight people have signed up to participate. Last Sunday, I attended the ordination of a faithful, talented young clergywoman I am honored to call my friend. My friend and her service were inspiring, and the preacher delivered a sermon that was intricate and erudite and drew me in for a rich and insightful and inspiring and intellectual journey. I want to preach like that tomorrow–intricate and erudite and rich and insightful and inspiring and intellectual. The challenges and heartaches of the last week make me want to retreat into the place of sense-seeking and meaning-making as I write. I want to weave the scraps and shreds of stories–MLK, Haiti, funerals, homelessness, youth, new leaders, ordination, crime, war–into a beautiful tapestry of God’s love and shalom persisting through the day and through the night. Somehow, I feel like I owe it to myself and to all those named (and unnamed) to tell their stories in the light and context of God’s love, justice and righteousness. I want to draw people into the whelming ache of my soul. I want the words to pour out evocatively enough to become justice rolling down like waters and righteousness like a flowing stream, to let my words become the Word that calls worlds into being, the Word that can break forth new light and hope in the darkest of nights. I want us to see ourselves jumping off and jumping in to that great River of Life, adding our power to the power of God’s current, flowing on in a great river of healing–for all the nations, for war, for earthquake, for poverty, for racism, for injustice, for violence, for crime, for despair, for prejudice, for ignorance, for greed, for isolation, for homelessness, for grief, for all that is broken and sinful and hurting in this world–let justice roll down like waters, and righteousness like a flowing stream. This! This is what I want from my sermon tomorrow! But I am filled with doubt, with fear, with anxiety. It’s too raw for presentation. Will they get it? If they haven’t been on my wild ride of these last few weeks, will this speak to them at all, or is it too personal? I don’t have time to explain or justify in this sermon. I can’t talk about the roots of the Haitian disaster in the legacy of slavery and indebtedness. I can’t pull the threads carefully through the loom to connect the Haitian revolution to the American civil rights movement. I can’t defend MLK as a prophet and preacher to a prejudiced or pretentious parishioner. I can’t explore the etymology of the Hebrew shalom, tzedek and hesed in contrast with the paltry and impoverished American understandings of “peace”, “justice,” and “loving kindness.” I can’t give a shout out to “supporting the troops” in the midst of a sermon proclaiming God’s mandate for peace. I can’t discuss excuses or blame or justifications for the homeless man’s alcoholism or immigration status, any more than I can discuss my friend’s amazing strength in facing her attacker, any more than I can resolve my conflicted desire to love and support my military family and yet stop the tragedy that is war. What can I say that will do justice to the depth of my thoughts and feelings, let alone do justice to the heartache of their lives this past week, let alone the astonishing depravity and disaster of the world, let alone the power of God to overcome and heal it all? And above it all the fear: will they even hear? And what if they do? And then, what if they listen? I want to be able to polish this up and smooth it over–to take away the rawness and frailty that is so objectionable, or at least to answer objections. I want it to be tight and cohesive and put-together. I want to insert my arguments against potential detractors, to mount my defenses so that I preach armed and ready for attack, or at least from behind the walls of the fort, with cannons aimed. I want to take “me” out of it–to call down some higher authority than my broken-open and healed soul, to rely on some theological white knight to sweep me up and out of the fray. But that’s not the way that it’s going to happen. It never is. For God’s justice to come rolling down like waters and righteousness like a flowing stream, we have to open our souls to the wildness of the river. We have to rant like John of Patmos, author of Revelation, about fantastical angels and horsemen and rivers at the end of it all. We have to wrench open our agony like Amos, declaring to the world that this should not be. We have to sweat through our shirts and whip the crowd into a frenzy like Martin Luther King did. We have to sing through the night of darkness and death like the people of Port-Au-Prince did, taking to the streets for a joyous march singing songs of praise to God. We have to raise our hands in the air and dance in ecstasy, because the Spirit has captured us body and soul and transported us into another realm. Because when God’s justice comes it is not soothing like the swish of the Ohio. It is not tame or controlled or calm or tranquil. When God’s justice comes it rolls down like great waterfalls crashing around us, stripping us down, breaking apart all that binds us and setting us free. Free for righteousness, for righteousness, our chance to do right. We are freed by God’s justice so we can lend our effort, our goodness, our righteousness, however frail and broken and halting and puny, to lend our good effort to God’s great river of life, to serve and to heal and to love and to bring peace to all those who weep, to become a part of the mighty stream that God sending throughout the earth. Even when all we have to contribute to the River of Life is our own stream of tears.